First discovered more than a century ago, most cosmic rays are blocked by the atmosphere from reaching Earth’s surface, requiring scientists to send up detectors on high-altitude balloon flights or space missions. Their name is a misnomer. Cosmic rays are not a form of light like gamma-rays or X-rays, but bits of matter sent careening through space by powerful forces elsewhere in our galaxy and beyond. “Cosmic rays are direct samples of matter from outside our solar system, possibly from the most distant reaches of the Universe,” said Eun-Suk Seo, lead scientist on the Cosmic Ray Energetics and Mass, or CREAM, instrument and a professor of physics at the University of Maryland. Scientists have flown variants of the CREAM instrument seven times on balloon research missions, logging more than six months of flight time. Engineers modified the existing science payload for the rigors of spaceflight, finishing the instrument for as little as $10 million to $20 million, Seo said, a fraction of the cost of a standalone space mission or an instrument developed from scratch. Changes to the balloon-borne instrument included making the on-board electronics more robust against radiation, and ensuring the package could survive the shaking of a rocket launch. Dozens of stacked layers of silicon pixels, carbon targets, tungsten planes and scintillating fibers will detect particles, ranging from subatomic units of relatively light hydrogen to heavy iron, coming from deep space and determine their mass, charge and trajectory. Each cosmic ray comes with its own backstory, and the particles will reveal clues about their origins as they collide with the matter inside CREAM’s detector. Scientists will trace the shower of secondary particles generated by each cosmic ray’s crash into the instrument’s cross section of pixels and targets. 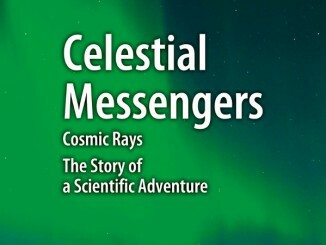 The most energetic cosmic rays can penetrate all the way to Earth’s surface, but detectors on the ground only pick up the leftovers generated from collisions with oxygen and nitrogen atoms in the atmosphere, producing “air showers” of secondary particles the rain down on the planet. CREAM will be sensitive to cosmic rays with higher energies than previous cosmic ray detectors flown in space, including the $2 billion Alpha Magnetic Spectrometer delivered to the space station on the second-to-last space shuttle flight in 2011. “What CREAM is going to do is to extend the direct measurements to the highest energies possible, to energies that are capable of generating these gigantic air showers that can reach all the way to the ground,” Seo said. Huge explosions like stellar supernovae, along with extreme gravitational forces from other cosmic phenomena, send cosmic rays shooting through space at mind-boggling velocities approaching the speed of light. One of the CREAM instrument’s chief objectives is to study where the particles come from. NASA’s Fermi Gamma-ray Space Telescope proved some cosmic rays come from the expanding debris remnants of supernovae, but the case is still open for other types of cosmic rays. But some cosmic rays are believed to be too energetic to be accelerated by supernovae. “A supernova is very powerful, but still it’s a finite engine,” Seo said. Subatomic particles like protons are the most common type of cosmic ray at lower energies, and cosmic rays become rarer as scientists look at higher energies. But balloon science campaigns found the drop-off in particle detections at higher energies is not as steep as predicted, a result known as spectral hardening. “At high energies that are in our energy range … there are more cosmic rays than were expected from the simple supernova acceleration scenario,” Seo said. Comparisons of two types of particles — protons and helium — suggest low-energy and high-energy cosmic rays could come from different sources. Seo said CREAM will build up statistics on the flux, or variability, of high-energy cosmic rays with continuous observations not possible on a short-duration balloon flight. One way physicists say cosmic rays could be born is during collisions between particles of dark matter, a mysterious substance that makes up about 27 percent of all the mass and energy in the Universe. Only 5 percent of the Universe is regular matter — stuff we can see and touch — while the rest is dark energy, an enigmatic force that helps drive the expansion of the Universe. “The question of whether these are from an exotic source like dark matter has generated lots of excitement, but for us to actually know whether there is some exotic source like dark matter, or an astrophysical source like a pulsar … we will need a lot more understanding of cosmic rays,” Seo said. Scientists from the United States, South Korea, France and Mexico are part of the CREAM project. The instrument weighs about 2,773 pounds (1,258 kilogrammes) inside the Dragon spacecraft’s payload trunk. Liftoff from NASA’s Kennedy Space Center in Florida is scheduled for Aug. 14. “It’s a very exciting time for us in high-energy particle astrophysics, and the long development road of CREAM culminating in this space station mission has been a world-class success story,” Seo said. 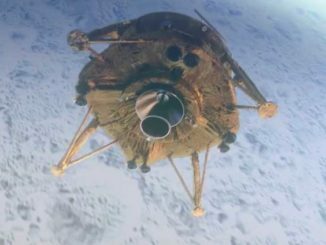 Israel’s Beresheet lunar lander carried out a critical rocket firing 4 April to brake into orbit around the moon, setting the stage for landing 11 April. 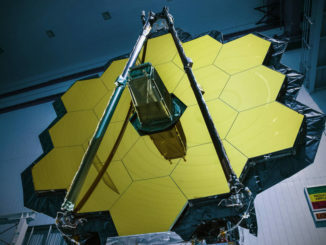 The centerpiece of the James Webb Space Telescope has arrived at NASA’s Johnson Space Center in Houston for a three-month test to ensure the observatory’s sensors and gold-coated mirrors work in the frigid temperatures of deep space.